This guidance is primarily intended for owners, occupiers, non-specialist building professionals, and others who take responsibility for historic buildings. It provides basic information on wall paintings and covers how to assess buildings for the potential survival of historic painted decoration. It also explains the steps that should be taken when are discovered, along with information on who to contact for assistance. Before the 20th century, wall paintings were a common form of decoration and they can survive hidden beneath later covering layers or materials. New discoveries of painted decoration within historic properties occur frequently across the country. Often, the discovery is purely accidental: during building works, or after specific events such as fire or flooding. Lack of awareness of the potential for surviving historic decoration is largely to blame for inadvertent damage and loss. 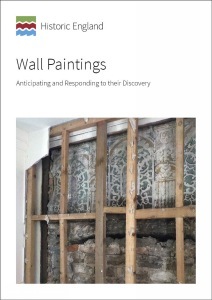 Moreover, when discoveries occur during building works, there are often both financial and scheduling pressures placed on any decision-making, and this can impact on the long-term care of wall paintings. Ideally, the presence of historic decoration will have been established well in advance. This way, the building work can be organised to avoid potential damage. However, when paintings are found by accident it is important to follow some simple guidelines which are explained in more detail here, including who to contact for further advice.